The Construction Schedule Templates for Excel are purpose built Excel templates designed to address scheduling in residential, commercial and generic construction projects. The Construction Schedule Templates for Excel are based on 5 day schedules but can be reused on an ongoing basis as required. 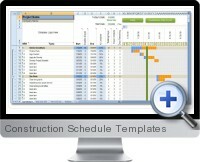 Construction Schedule Templates for Excel keep track of construction processes enabling homeowners, builders, designers and construction managers to plan and manage construction jobs in the most efficient and effect way possible to save money and satisfy client requirements in the least time possible. These Construction Schedule Templates for Excel are ideal for quickly building construction schedules for any type of project and include Gantt charts that adjust automatically to task items and dates. The templates are preloaded with primary tasks and sub tasks to facilitate the entering of information and customization. Easy to use with professional style presentation and results. Reuse the templates over and over again as required. Gantt bars automatically fill in the dates of performance. Color changing to automatically indicate percentage complete. Red bar to clearly show current date. Scroll bar inside sheet to see tasks and scroll within the bar chart. Integrated help inside the templates. Establish time lines that everyone can understand.